At MK Metallfolien, we safeguard the high quality of our products by using ultra modern machinery and installations. 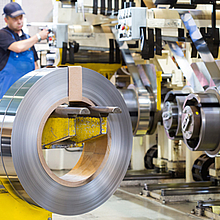 Besides preventive maintenance, also continuous modernisation safeguards our state of the art and hence the manufacture of precision strips and foils to the latest production standards. Computer control and non-contact measuring methods guarantee reproducible, consistent product quality and the tightest tolerances.